Dutch Apple Pie is made with a spiced apple filling in a flaky pie crust topped with a streusel made of flour, sugar, and butter. 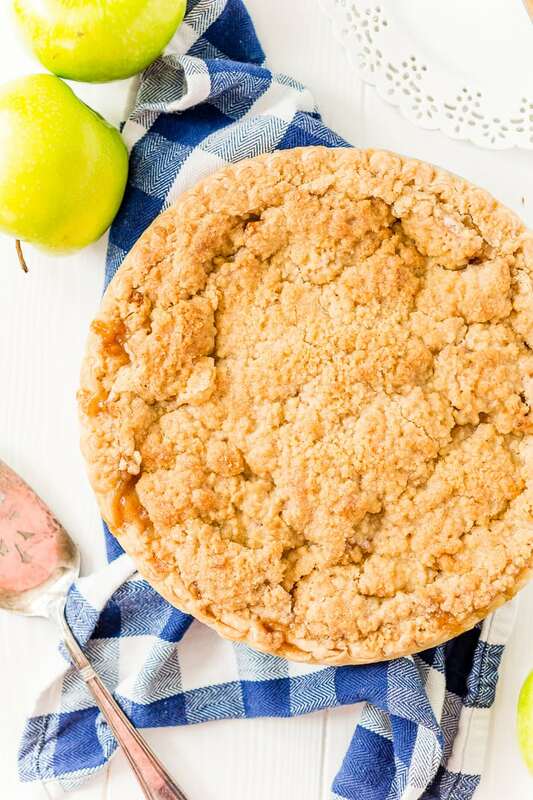 This Dutch Apple Pie recipe is the perfect way to enjoy fall flavors and fresh-picked Granny Smith apples this season! If the thought of making an apple pie intimidates you, it’s because you just haven’t found the right recipe yet! This Dutch Apple Pie is made with a store-bought pie crust (shh, don’t tell! ), and topped with a rich, buttery crumble that’s totally irresistible. JUST TAKE ME TO THE DUTCH APPLE PIE RECIPE ALREADY! 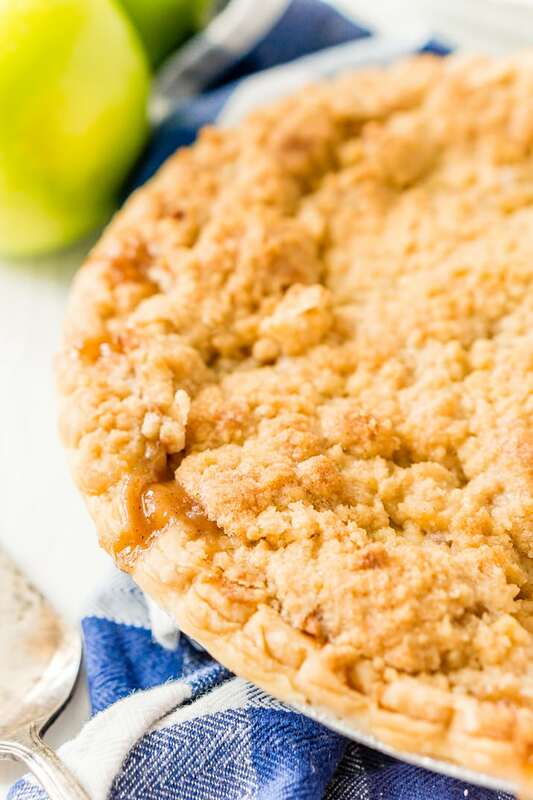 If you’d rather skip my (very helpful, I think) tips and tricks, essential cooking info, and similar recipe ideas – and get straight to this deliciously easy Best Ever DUTCH APPLE PIE Recipe – simply scroll to the bottom of the page where you can find the printable recipe card. It’s that streusel topping that makes an apple pie “Dutch”! Not to be confused with French Apple Pie, which has a less sweet and softer textured crumble topping. To further explain it, let’s put it this way: if a regular apple pie and Apple Crisp had a baby, you’d get Dutch Apple Pie. What is the difference between a Dutch apple pie and an apple pie? The difference lies mainly in the topping. 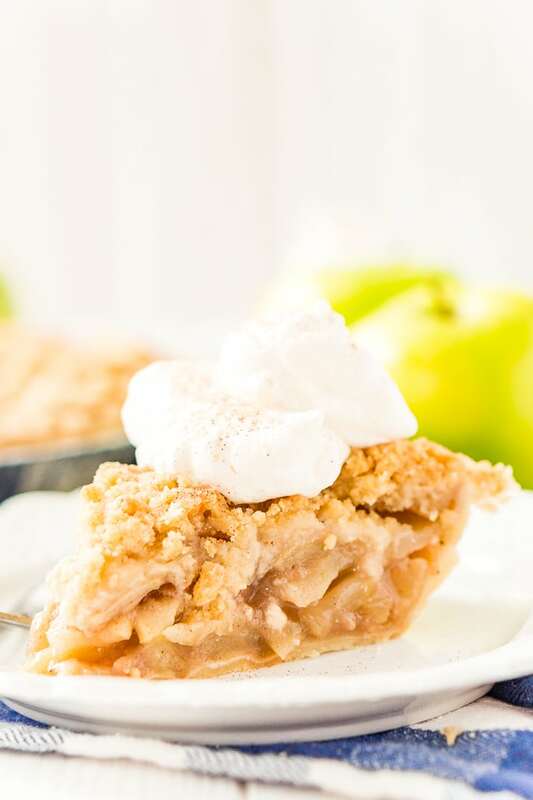 A traditional apple pie is a double crust pie, meaning it has pie crust on the bottom and the top. A Dutch Apple Pie has a streusel topping made with butter, flour, and sugar. Another noteworthy difference is that Dutch Apple Pie has a touch of lemon juice in the filling. 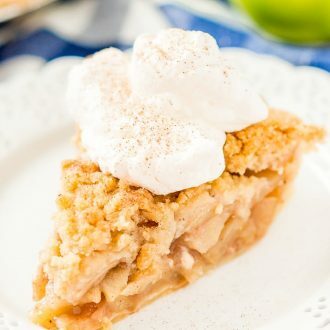 And while not all traditional apple pie fillings are cooked on the stove top before baking and thicken with cornstarch, a Dutch Apple Pie will always use fresh apples tossed in a sugar, flour, and spices mixture. Is Dutch Apple Pie really Dutch? Good question, the answer is no. Although the origins are European, the version we know today was adapted over generations and through different colonial factions using ingredients available in the New World. 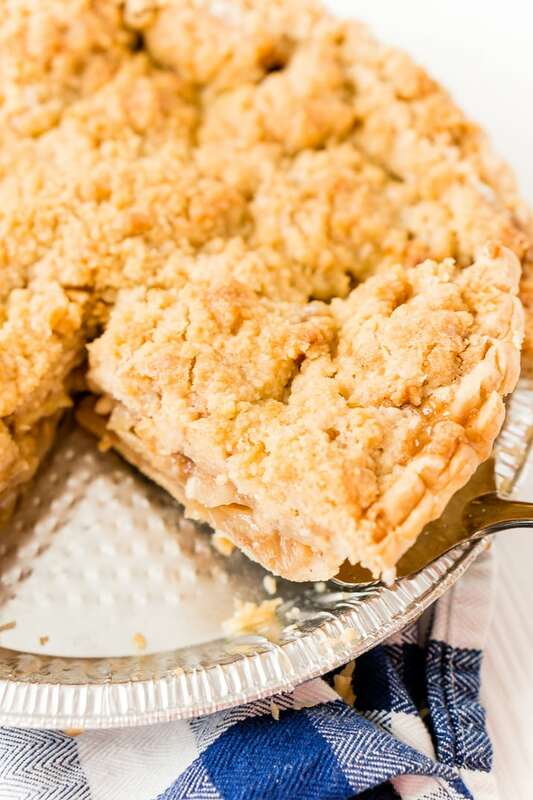 The final adaptation that stuck was a flaky pie crust, a spiced apple filling, and a streusel topping that was actually made in Pennsylvania by French colonists in the 1600s. 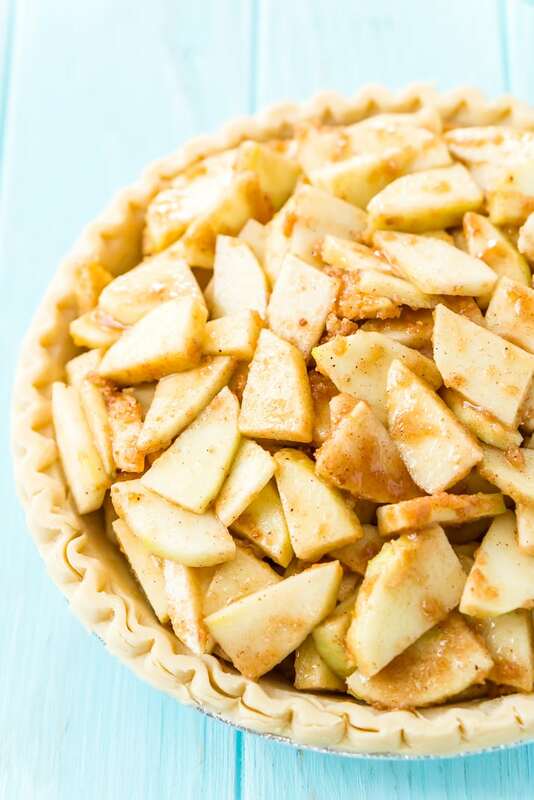 This recipe combines the sweet-tart flavors of tangy Granny Smith apples, brown and white sugar, vanilla and almond extracts, and warm cinnamon and nutmeg. A squeeze of lemon adds a touch of citrus, and a few tablespoons of flour thickens up the filling so it’s extra luscious. Pile it HIGH! It might seem like you have too much filling, you probably don’t. This recipe is meant for a standard 9-inch pie crust (not deep dish) and you want to mound all of the ingredients into the crust to make a dome. Make sure to gently press the apples down so that they fill all of the crevasses. Then pile on your crumble topping! Let it Set! I prefer my Dutch Apple Pies to be made with granny smith apples and a lot of times this means it’s really juicy right after it bakes. But if you let it sit for several hours (better yet, overnight) then those juices will thicken back up and leave you with a perfect pie. You can always reheat the pie a bit before serving, but I like mine to be room temperature. Use a Baking Sheet! As I just mentioned, this pie gets juicy while it bakes and there’s a chance the juices might seep out. I highly recommend wrapping a lipped baking sheet with aluminum foil and placing your pie on it while it bakes to protect your oven! The aluminum foil makes for easy cleanup, trust me, you don’t want to have to scrub burnt sugar off the baking sheet. Don’t Forget the Foil! Because of the topping of this pie and because it starts off at a rather high height, using a traditional pie crust guard could prove to be a little risky – we don’t want it sticking to that delicious topping. So what I like to do is use two pieces of aluminum foil and dome it over the pan and pie so it’s not touching the pie and bake it that way for about 30 to 35 minutes, then I remove the foil and finishing baking the pie so the crust can brown up. Dutch Apple Pie Topping is a simple mixture of flour, butter, white, and brown sugar. It starts soft but gets crunchy as it bakes. Eat it hot with a scoop of vanilla ice cream or a dollop of whipped cream! Trust me, you’ll have a hard time stopping at one slice! I love this recipe because it gives you the delicious flavors of traditional apple pie without a lot of work. It’s perfect to serve at any gathering from now through the holidays. Or, just make one to enjoy at home … after all, you need to use up all those fresh-picked apples, right? 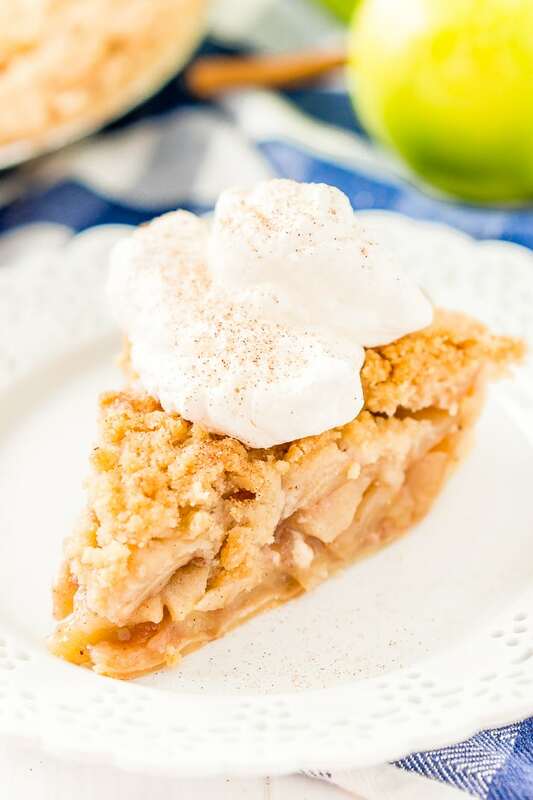 Dutch Apple Pie is a simple way to savor some of your favorite seasonal flavors and get your apple fix! Bake up this classic dessert, and get ready to hear accolades from all your family and friends. How Long Does Apple Pie Last? You can keep baked apple pies at room temperature for up to two days. If the pie has been sliced, cover loosely with foil or plastic wrap to ensure freshness. An apple pie will keep for an additional 2 to 3 days covered in the refrigerator. 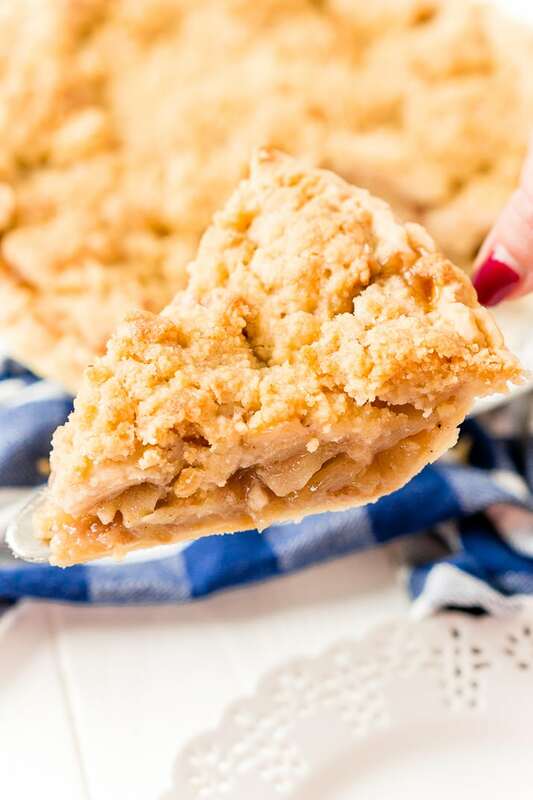 Pin this Dutch Apple Pie Recipe for Later! Preheat oven to 375 degrees F and prepare your pie crust and place it on a rimmed cookie sheet and set aside. Peel and slice your apples into 1/4-inch slices and then slice them in half and add to a large bowl. Add the remaining filling ingredients to the bowl with the apples and toss to coat. Transfer the apple filling mixture to the prepared pie crust and gently work the apples so they're nestled together without too many large air gaps. Apples will likely still overflow the crust, this is okay. Prepare the topping by mixing the ingredients together in a small bowl until crumbly. Sprinkle the topping mixture over the apple mixture. Use aluminum foil to create a dome over the top of the pie, make sure it's not touching the pie itself. Place the pie in the oven (make sure it's still on the cookie sheet) and bake for 35 minutes. Remove from the oven and remove the aluminum foil, place the pie back in the oven and bake for another 15 to 25 minutes, the top should be golden brown and the pie mixture underneath should be bubbly. Remove from the oven and transfer to a cooling rack to cool completely. Serve at room temperature or reheat slightly and serve with ice cream or whipped cream. 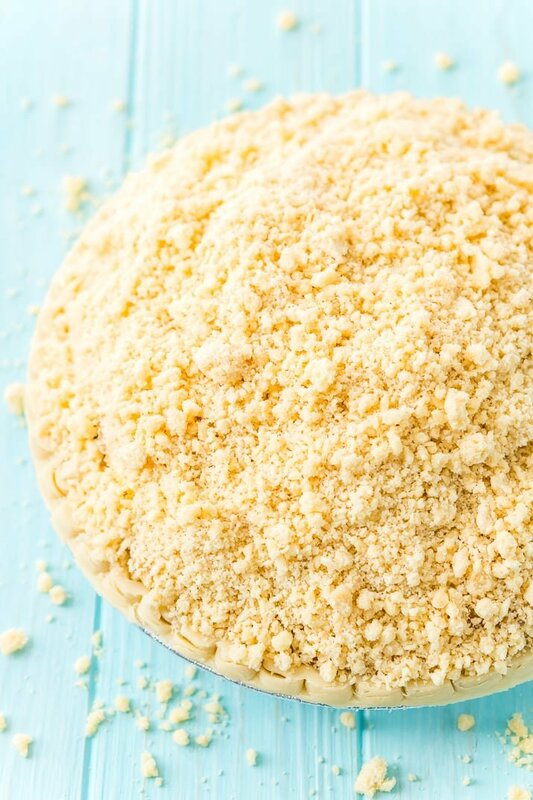 You can use any pie crust recipe you want or use a refrigerated or frozen pie crust. Follow the package instructions for preparing the pie crust. Do not par bake the pie crust. The nutritional information is an estimate per serving for the filling and topping ONLY, as the crust is left up to you and can vary greatly depending on the type of crust you use. Dutch apple pie is so impressive, but it’s so much easier to make than I ever thought. Especially now I have your helpful tips! This recipe is extremely easy to follow. Thank you! So glad you found my tips helpful, Helen! Dutch Apple Pie is one of my all time favorites. I mean, who wouldn’t love all those crumbs on top of sweet spiced apples? Yours looks phenomenal! Love your tips and feel it’s so helpful to tell people to pile those apples high before baking. Great recipe!